As is usual, the president is generalizing in a manner that so occludes the facts that they become nearly meaningless. History, when merely massaged into a form that is most convenient to promoting excuses for grabbing what you lust for, fails to teach the Truth, and one is then doomed to repeat the sad past. Even more sadly, the president is seemingly intent on not only doing this ignorant thing to himself, but intent upon dragging an entire nation down with himself, in the process. It is unusual for the president to say much good about America’s history. Usually his narrative views our ancestors, including the Pilgrims, as bad guys who exploited the Natives, even utilizing genocide, and then exploited the rest of the world, whereas the alternative, (IE: his new and improved ideas), are proof of his wonderful something-or-another, which he hasn’t been too clear about defining. The actual facts concerning New England’s early history are far more tragic than most understand, and do not involve the Pilgrims, for they were not there yet. When Squanto returned to his home village in 1619, after a fourteen year odyssey through England, Newfoundland, and Spain, he did not find a village decimated by a Pandemic. He found no village at all. The New England Pandemic was worse than the Black Death in Europe, or, for that matter, any other pandemic I’m aware of, (though Influenza in 1918 killed 80% of the people on some Pacific atolls). The New England Pandemic of 1618-1619 may have killed 98% of the population of the Massachusetts and Waupanog tribes. No one can be sure of the numbers, but I have read the population of southeast New England may have been reduced from roughly 30,000 to roughly 1000. Most histories I’ve read use words like “wiped out”, which indicates the horrible thoroughness of the disease. Above is a picture of the Leptospira bacteria, which is now world-wide, and still has a few strains that can overwhelm the human immune system In the worst cases it can cause some of the symptoms (yellow skin, bleeding lungs), of the horrible New England Pandemic. However many other bacteria and viruses have “strains” that, when introduced into the unsuspecting immune system of an unexposed population, cause disaster. My personal favorite, (if you can use such a word for such a tragic topic), is some sort of “swine flu”. Native Americans apparently very much liked the flavor of pork, (as I do,) and in some cases preferred it to native game. However neither French fur trappers nor British cod fishermen nor Dutch traders carried pigs with them, (though they may have had some salt pork). It wasn’t until native populations were exposed to living pigs that the tragedy occurred. Interestingly, the early Spanish explorers seeking gold and the Fountain of Youth traveled with a herd of pigs, and reported “kingdoms” in areas where, a quarter century later, following explorers found “no kingdoms”. However these are all guesses. Until science can examine 400-year-old bones and determine what the person died of, all guesses will remain guesses. At the moment our science is too backwards to display such skill, and if our science is backwards now, it was even more backwards 400-years-ago, and the suggestion that any intentional germ warfare was going on is preposterous, especially because people hadn’t discovered “germs” and their ideas of the causes of contagion waxed upon witch-doctoring. Therefore I was a bit dismayed to learn a teacher was misinforming her students, and suggesting the Pilgrims infected the Massachusetts and Waupanog tribes by giving them blankets from people sick with smallpox. (This “germ warfare” incident did occur, but 140 years later, in a war with Chief Pontiac, and its effectiveness is disputed). I did my best to educate that teacher, but the incident struck me as significant, for it showed me how people who obviously haven’t made much of an effort to study history will make outrageous accusations, under the guise “it is history”. In my opinion such smearing is more indicative of their personality, and of the possibility they are “projecting” from some personal sense of weakness and guilt. The actual factual history is that, when Squanto got home, before the Pilgrims, no one was alive. It is painful for me to imagine being in his shoes, for I imagine he was thinking he’d enjoy a reunion, and that he had long dreamed he would sit by a fire and tell tales of his adventures, but instead he likely found the ruins of wigwams, and perhaps bones and skulls, (for when so many die so swiftly there is not the dignity of funerals). Then he would have set out to find someone, anyone. Apparently he found a group of survivors in Rhode Island. But think, if you will, what sort of state of mind those survivors would have had. To even function, after seeing just about everyone you have ever known die, seems an achievement to me. (I have a hard time when only one person I care for dies.) If the survivors were a bit weirded-out I wouldn’t blame them a bit, and I did read that the leader of the survivors kept on his person, as a sort of keep-sake, a mummified hand. I doubt that was ordinary behavior, in that civilization, before the pandemic. After spending time with this traumatized bunch Squanto may (or may not) have wished he could talk with people who were not so weirded-out. I’ve never seen this suggested in any history book, but I think I’d feel that way. Even talking my native tongue wouldn’t feel like something I was completely at home with, as there likely would be variations between the dialect, slang and pronunciation of the survivors of many different villages. It was a situation straight from a science-fiction movie, where a nuclear blast has hit a modern city, and you have two survivors from a ghetto living with two survivors from a high class neighborhood. In other cases you might have had a Hatfield survivor meeting a McCoy survivor. Last but not least, Squanto himself hadn’t talked his native tongue much in over a decade, and it may have seemed oddly unfamiliar to do so. Therefore, hearing that a group of English people had arrived might have seemed, as weird as it may sound, more like going home than his actual home was. Meanwhile the Pilgrims had landed some seven hundred miles off course, on the wrong side of Cape Cod, and were running out of food. They tried to contact some natives, whom they glimpsed from afar, on the shore, but the natives did the wise thing, which was to run like hell. (This was wise because European sailors were always tempted to kidnap people, as kidnap was acceptable in those days, and there was a fine market for kidnapped people in Europe, where over a million white people were slaves in the Mediterranean), (some glad to be servants in warm villas, and others chained to the oars of galleys). Considering no natives would even talk to them, the Pilgrim men were forced to forage for food, and somewhat amazingly chanced upon a huge storage pit of corn. (It has been suggested there was a corn-surplus, as there was corn harvested to feed 30,000, but only 1,000 left eating.) Hopefully they left some sort of payment or IOU before they headed back to the Mayflower, though I myself have not yet seen a record of it. It was snowy and bitterly cold, and, if they failed to leave an IOU, it likely was because their toes hurt really bad. Instead they forged west along the north coast of Cape Cod until they ran into the mainland, and could go west no further, and landed at a place that by sheer coincidence happened to very near the spot of Squanto’s home village. And there they found themselves in a dreadful fix. A winter colder by far than any they had ever experienced was coming on, and they had to build housing and chop firewood. Food? I suppose they could dig clams, but by all accounts it was one of those winters when sea-ice makes even clamming impossible. Many died, including some of my ancestors. However against all odds the Pilgrims survived. When I sit back and contemplate the possibilities, it seems fairly obvious that, if you do not believe in the Grace of God, then you must concede that the slings and arrows of outrageous fortune were aimed just over their heads. They very well could have perished, and been like other “failed colonies”, were it not for some odd flukes of fate. Consider first the odds of a bungling shore-party chancing upon a storehouse of native corn. Pretty slim. Next consider what would have happened if they arrived two years earlier, and were met by a population of 30,000 rather than 1000. 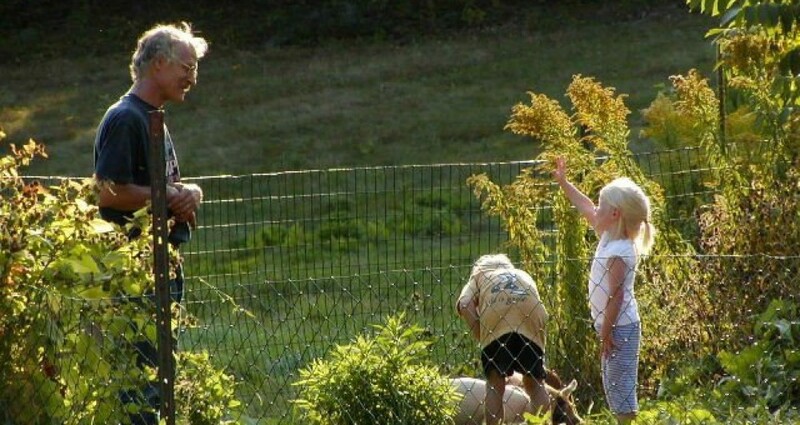 They arrived at just the right time, when there was no one to object to them moving in. What are the odds of that? And did it enter anyone’s pragmatic calculations? The answers are “slimmer” and “no”. The Pilgrims were not pioneers. They didn’t have to clear fields, for the fields were already clear and ready to plant, but the former farmers had vanished. However the dopes arrived in November when it was too late to plant anything. What good did cleared fields do for them? I would say that the probability of a blessing like Squanto occurring is so slim it needs to be considered, if not actually defined, as being miraculous. I certainly would never count on such good fortune occurring to me, if I ventured to a foreign place. Then what happened? Squanto died only a year later, not on American soil but aboard a ship several miles off shore, of a fever. The first generation of Pilgrims lived at peace with the natives, despite squabbles, likely because they were too busy simply surviving to do anything else. Also word got back to England that there were farms without farmers in southern New England, and boat after boat loaded with Puritans set sail. I’ve read over a hundred ships disgorged their passengers in a single year, at Boston, (my family name arrived in 1628), and an amazing 20,000 had settled in short order, but the troubles this influx brewed with the Dutch to the south, and the schism that occurred in a single tribe that broke into the Mohegan and Pequot, and how the prosperity brought about by the fur trade led to greed and war, is a story for another night. Tonight I’m talking turkey, which involves Pilgrims. What happened to them? Roughly a hundred survived the first winter, and a second ship arrived the next year with roughly a hundred more, and now, when you look around the United States, how many can claim to trace their roots to the Mayflower? At the very lowest, I’ve read ten million, and I’ve heard as high as thirty million. 10% of the American population. To have an ancestor from the Mayflower is not all that uncommon. She looked taken aback, and even a little alarmed, but, once she understood I wasn’t going to actually hug her, she was old and wise enough to catch my drift, and perhaps even to see that the Mayflower Covenant is still in effect, and we are all on the same boat, even as some are old and sit on a patio and some are young and clip at the edges. I thought I detected a twinkle in her eye as I got back to work, and, in the end, she didn’t fire me. In fact if our president, (who is about as Unamerican as you can get, in my humble opinion), carefully examined his mother’s family tree, he might discover he had William Brewster as an ancestor. Likely it would trouble him, and even seem a political liability. However it might wake him up, and he might avoid the stupidity of comparing the poor Syrians (fleeing the mess his policies have bred in Syria) with Pilgrims. First of all, the Pilgrims had time to think about what they were doing. They had time to deliberate. When they decided to oppose the king and move to the Netherlands, it was their decision, and planned out. Second of all, the Pilgrims arrived on a coast where 98% of the population had died. The Syrians are not arriving in a similar situation. This amounts to an enormous difference. 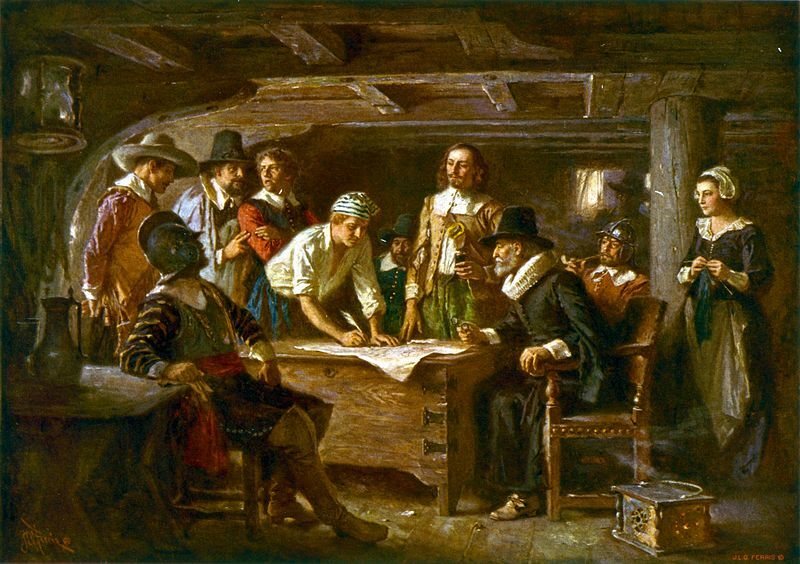 Lastly, the Pilgrims wrote the “Mayflower Compact”, which expressed a willingness to seek unity and avoid anarchy, even if it involved associating with a King who did not much like them. Our President seems to feel it is offensive to ask Syrian refugees to make any similar statement, even if it involves obeying the laws of the land which is offering them refuge and succor. If the president really cared for the land whose laws he has sworn before God to uphold, he would make sure the refugees promised to obey the laws he has sworn before God to uphold. Furthermore, as some refugees interpret Islamic Law as “allowing lying”, he should state that rather than placing their hand upon a Bible to pledge allegiance, they should thrust their arm into the sleeve of a lie-detector. However our president will never do that, because if he asked that of others then others might demand he do the same, with his own arm, in the same lie-detector.